ImgBurn is a freeware DVD burning tool that allows you to take a DVD folder (AUDIO_TS, VIDEO_TS folders, with IFO/BUP and VOB files) and then burn a DVD-video disc that should be compatible with standalone DVD players. This guide goes through the basics of how to do this. This guide will quickly go through the ImgBurn functions without going into much detail. For detailed guides on ImgBurn, please refer to the Guides section of the official ImgBurn forum. You may also want to refer to our ImgBurn for Dummies guide. Insert a blank DVD disc. Start ImgBurn. From the "Mode" menu, select "Build". 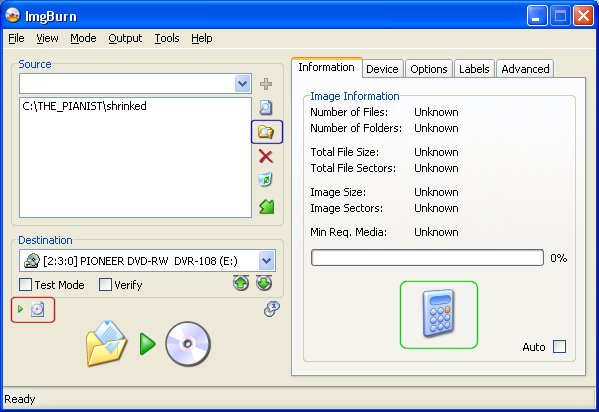 Click on the button (marked in blue below) and load in your DVD folder (see screenshot below for example). Click on the button (marked in red below) to switch the output to disc mode (you can tell you are in "disc mode" if the "Test Mode" select box is shown). Finally, press the "Calculator" button (marked in green below) to tell ImgBurn to see if files you are burning will fit onto the disc. If you are burning onto a dual layer disc, then additional steps may be needed to choose a layer break. For more information, please refer to the Guides section of the official ImgBurn forum. If your drive supports it, you can go to the "Device" section and change the "Book Type" for the burn to "DVD-ROM" for DVD+ media, for increased compatibility. For more information, please refer to this page of the ImgBurn for Dummies guide. Click on the "Options" tab to go there. Make sure the "File System" is set to "ISO9660+UDF". Click on the "Labels" tag and enter a label for your backup. All we need to do now is to click on the big "Write" button (see below) to start burning the disc. You'll be prompted to confirm the action - just press "OK" and the burn will now start. Got more questions? Post them in our ImgBurn Forum and get them answered by other expert users.